A ground floor apartment in a villa with garden right on the waterfront. From the garden and the terrace you can see the coastline from Pozzillo to Taormina and even Calabria in the distance. You can access the sea directly from the garden through a path that goes directly down to the lava rocks. In summer (June 15 to September 15) stairs are built on the lava rocks in order to make it easier for people to plunge into the sea. The house has a living room with sea view, doors to the terrace with a great view that stretches from the typical lava rocks in front of the house to Taormina in the distance. The house further comprises a double bedroom with sea view, a simple kitchen, another bedroom with two single beds, and two bathrooms with shower, toilet and bidet. The terrace is equipped with garden furniture. Wireless internet is available and included in the price! The house is situated at the end of a street with seafront houses, at 500 meters from the center of Pozzillo and it is a strategic place from where to explore Eastern Sicily. Exploring Mount Etna: Pozzillo is an excellent base from which to explore Mount Etna and its surroundings. The villages of Etna, such as Trecastagni, Zafferana Etnea e Randazzo, are famous for their ancient lava flows, the architecture of their seventeenth century churches, their delicious local produce and the hospitality of the villagers. Situated 700 metres above sea level, they are a favourite retreat of the city dwellers who, in summer are in search of cool, fresh air, while in winter are in search of snow for skiing. Few people are aware that Etna is a popular location for skiers in winter. On some glorious days in winter, it’s even possible to ski the frozen slopes in the morning enjoying a wonderful panoramic view of the Mediterranean, and then, the same afternoon, go and sunbathe on the beaches below! If you are at least 4 people, Roberto can also prepare a dinner or a lunch for you. You can reserve this service via email or directly by talking to Roberto while you stay in the house. You can choose between two simple but abounded menus: - Meat Menu for 25 Euros per person with water and wine included; - Fish Menu for 35 Euros per person with water and wine included. The menus can always be adapted according to the guest preferences. Roberto also organises Etna tour and can help you renting electrical bicycles! Unfortunately the weather was not kind the week we stayed. Biblical rain, fog and cold;. so we could not take advantage of the garden.We were two older ladies who had decided to hire a car. My American friend did all the driving and found it quite stressful…...Sicilians seem to skip lights ...double park and generally scare the hell out of you. I am sure a younger person may find driving easier. Our two highlights of the week were going to Taormina, which is beautiful, and seeing a friend who lived in the centre of Sicily in Caltanissetta.Would we return? probably not unless we had a driver, a tour guide and hopefully sunny weather. The flat has many good points. The rear garden facing the lava rocks and the sea is delightful. There is generous off road parking and a great space for a barbecue. The lounge and bedrooms are well proportioned but the kitchen is cramped. It is very quiet and peaceful. We were made to feel welcome and Roberto was very helpful. Pozzillo at the end of October was pretty grim. Everything was closed so things appeared sad and neglected. There is a real and ever present problem with litter. Our trip up Etna, arranged by Roberto, was excellent and a highlight of the trip. Super accueil! Très bel emplacement avec une vue magnifique, l'accès à la plage est très pratique. De bons conseils de la part des propriétaires sur les visites et excursions! Zeer rustige plaats. Tuin met prachtig zicht. Waren hier 10 dagen en konden iedere ochtend buiten ontbijten. Eigenaars zeer discreet, vriendelijk, uiterst behulpzaam en erg attent. We kwamen 's avonds toe, wijn en citrusvruchten stonden klaar, de verwarming was aan, er was koffie en melk voor de eerste ochtend... Omgeving is zeker de moeite voor minstens 1 week (barokke stadjes en natuurlijk de Etna). Tip voor een mooie wandeling vanuit Casa Busa: via Cali naar Stazzo, +/- 5 km h&t. Vanaf Cali mooie promenade langs de zee. Nice house and wonderful beach with lovely view. The house and location was very nice but we did not like that the owner was looking around in the apartment when we was out. If not the house had got a 5 star review. Roberto, the owner, asked you before if he could enter in the house for reparations that could be done only from the inside of the holiday home. Ofcourse he didn't touch or look at your things / stuff or whatsoever. He is surprised to hear so, as he asked before and you said it was no problem. Casa Busa is all you could want for your holiday home. Everything you may need is in the apartment. It is clean and comfortable with lovely sea views from your own little garden. From the garden you can clamber over some rocks and be in the beautiful clear sea water in 2 minutes. The owners Mr & Mrs Busa were very welcoming, happy, helpful and nice. The apartment was excellent and we had a great stay.. However we were somewhat disappointed Sicily as there was rubbish overflowing from bins and fly tipping EVERYWHERE that we went.....surprisingly there was no smell. 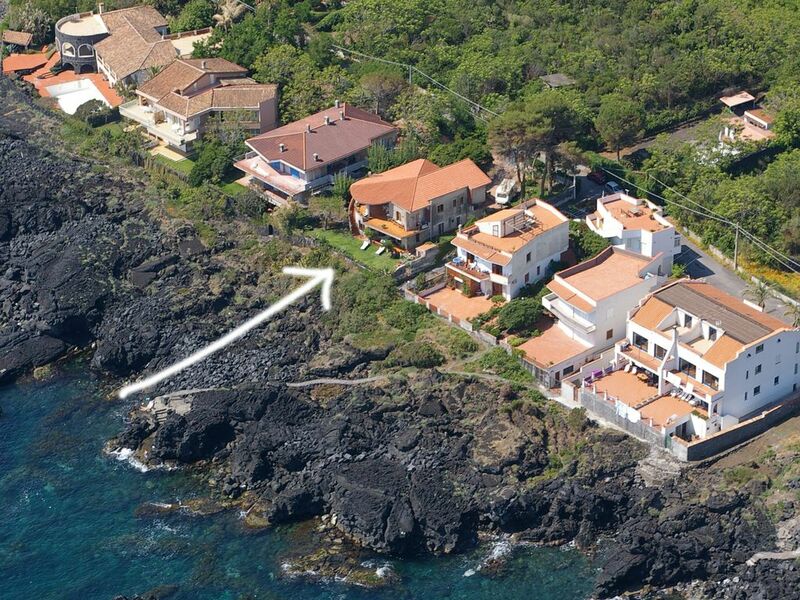 The house is situated at the end of a street with seafront houses and at 500 meters from the center of Pozzillo. Pozzillo is a small, authentic fishing village that has a harbour where fishermen still tear up daily their colorful boats onto the black lava beach. Two streets away from Casa Busà (via Carammone 30) there is a grocery store which sells bread, fish and fresh eggs. The area of Pozzillo is characterized by lemon groves on the seaward greeny slopes of Mount Etna. Pozzillo is an excellent base from which to explore eastern Sicily. The quaint fishing village lies halfway between Catania and Taormina and just five kilometres from Acireale (a pretty little city, built on a plateau of lava, that is known for its Baroque churches). Giardini Naxos, a seaside resort with beautiful sandy beaches, is just 25 kilometres from Pozzillo. Beside it we find Taormina ‘the pearl of the Mediterranean’ and the most exclusive seaside resort in Sicily. Other Activities: excursion to Mount Etna. Prices include wireless internet, final cleaning, linen and towels, water, gas, electricity.